Using family recipes and memorable dishes from travels, Chef Jonas Ng gives guests a memorable shared dining experience, one dish at a time, at his restaurant James & Daughters by Le Jardin. 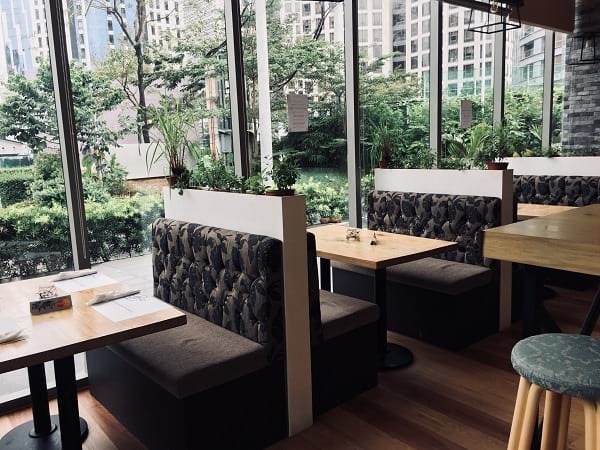 At the chef's new restaurant, the food is a family affair, as they welcome guests to this bright and spacious corner in BGC, located at the quieter side of the neighborhood. Here, one can experience what soul food is to the Ng family as they share their favorite dishes at home, around the country, and abroad --- as refined and interpreted by Chef Jonas. The restaurant is named after the chef's father, James, and the daughters, Jonas' siblings. Comfort food at the restaurant also highlights made from scratch specialties and local, sustainable ingredients. Here's a look at must-try items at James & Daughters -- where food is sustainable, locally-sourced, and comforting. 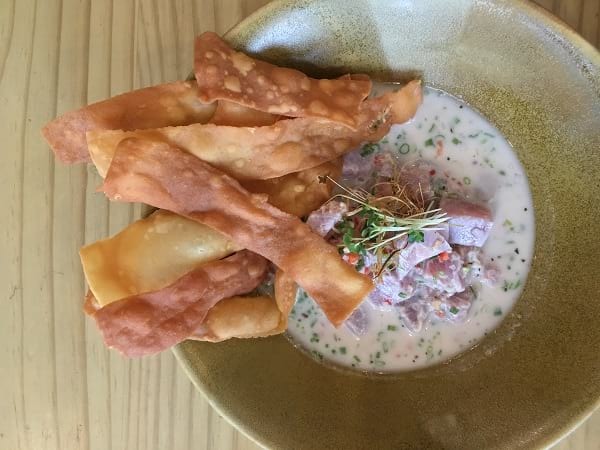 The seafood dishes at this restaurant sing beautifully, with small plates like Tuna Kilawin (P420), which takes succulent chunks of fresh yellowfin tuna loin and combines it with bright and zesty flavors of coconut vinegar, coconut milk, coconut sugar, and red chilies. It's lipsmacking and highly addicting, and comes with crispy wheat strips you can use to scoop up more of the leftover juices. 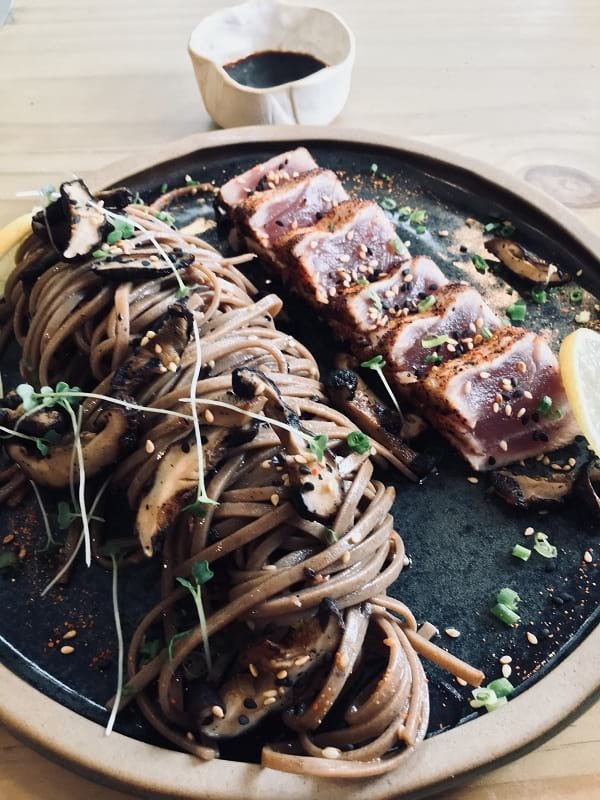 The Seared Togarashi Tuna (P495) also delivers excellent tuna slices, seasoned with Japanese 7 spice, served with cold sesame soba and grilled shiitake mushroom. 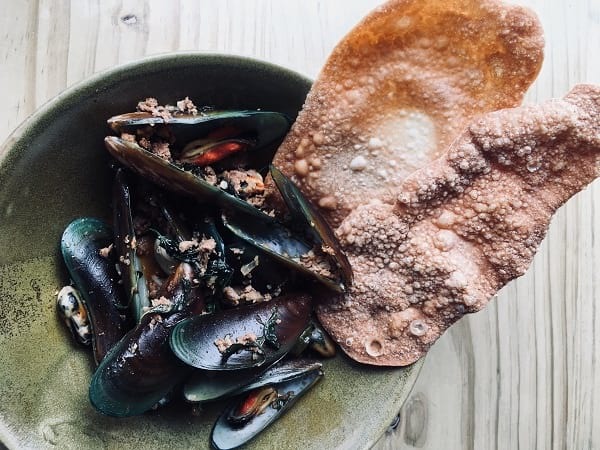 Their Chorizo Mussels and Laksa Leaf (P375) is also a must-try, a bowl of fresh local mussels tossed with homemade crumbled chorizo, and stir fried with Vietnamese coriander and white wine. 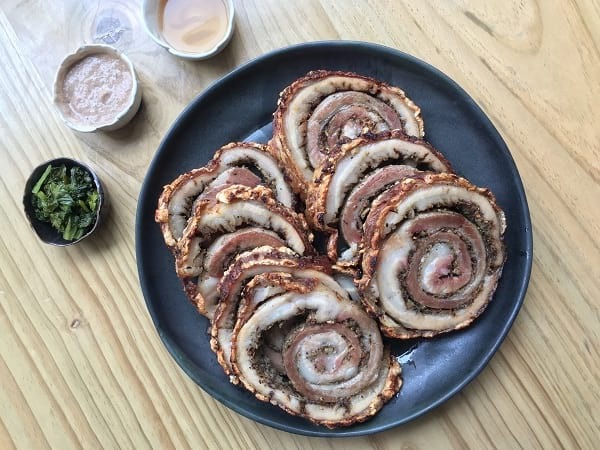 The flavors are both meaty and briny, punchy to the point that you might be tempted to order this appetizer with some rice so the sauce does not go to waste. The chef also showcases his mother's cooking here -- with his own twist -- and just as mom's recipes go, they are comforting and dishes that you can crave on a daily basis. 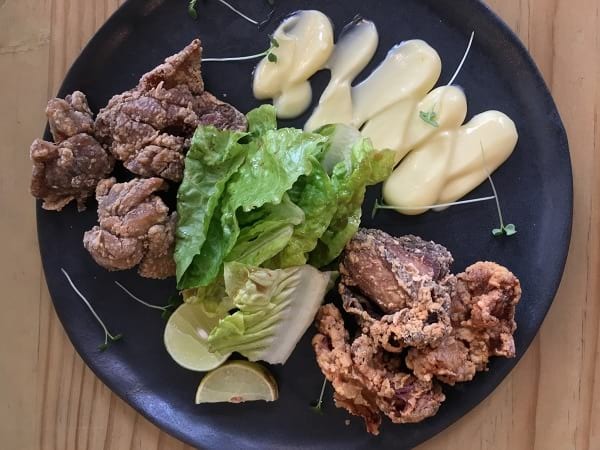 The Duo of Mom's Fried Chicken and Tori Karaage (P475) combines two styles of fried chicken -- his mom's fish sauce marinated fried chicken reminiscent of Asian chicken chop with its spices, and a classic Japanese style fried chicken, served with Japanese mayo and lime. A personal favorite (and current craving) is Mom's 5 Treasure Soup (P380), which the chef carries onward to James & Daughters from their old San Juan restaurant, Huat Pot. And thank goodness he decided to bring it back, because it's truly one of the most delicious soups around that soothes the soul in every sip. 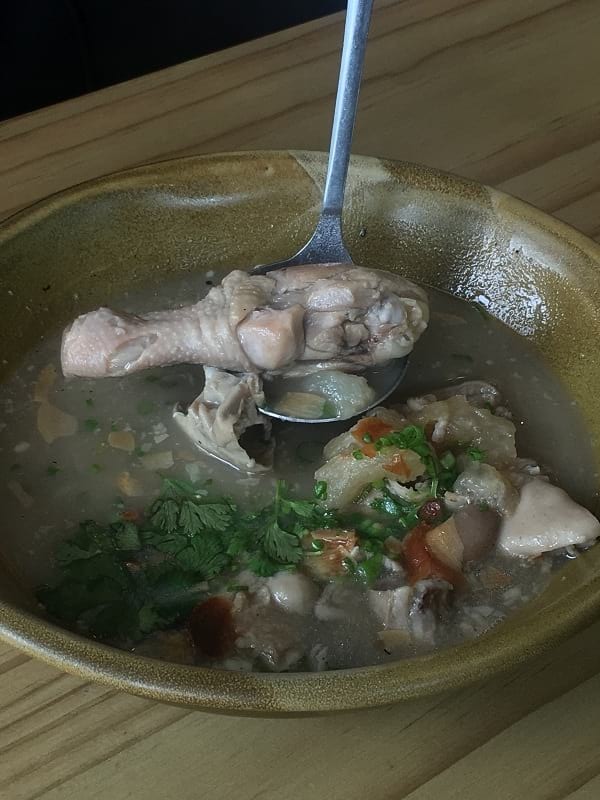 Their version of the traditional Chinese soup combines chicken, sea cucumber, pork feet, stomach, and tendon, making the bone broth very potent and lipsmacking. A bowl soothes the belly and I can imagine it curing a hangover, too. After eating fried chicken and chicken soup, we return to the sea with a couple of large plates. 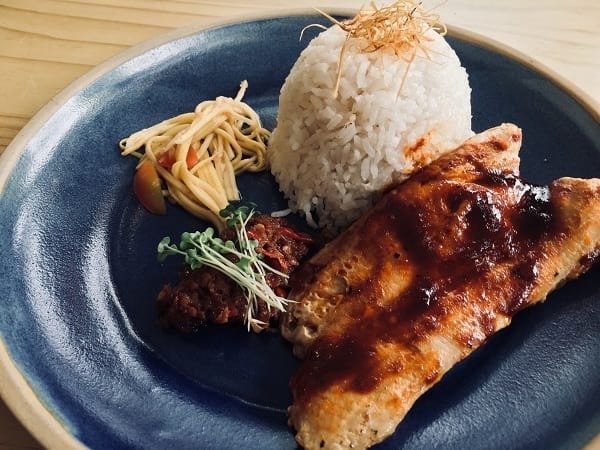 The chef takes inspiration from his travels to Kuala Lumpur and offers BBQ Stingray with Laksa Rice (P575), the thick slice of stingray's wing chargrilled and wrapped in banana leaf. This hawker favorite is served with laksa rice, spicy house sambal, and green mango salad. 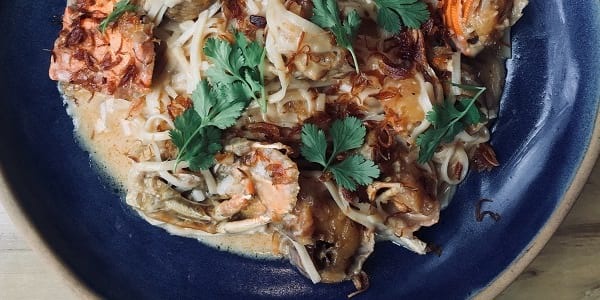 We learned during our lunch that day that one of Chef Jonas' siblings loves to eat lobster, and so the next dish was was dedicated to that younger brother: Lobster Cheese Butter Noodles (P1,800), something that is inspired from eating around Hong Kong. 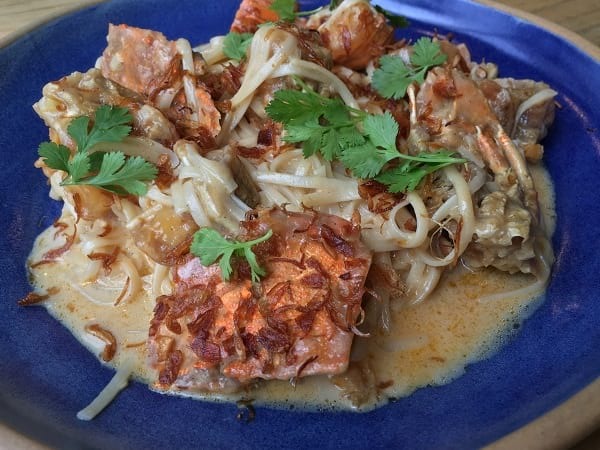 Big chunks fresh local slipper lobster adorn a plate of egg noodles swathed in butter and cheese. It's tough to find something to dislike here since cheesy noodles, fresh lobster, and anything with butter pretty much spells out delicious. Round up your family and friends for these next dishes, because they're big hearty servings of meat and seafood that make the perfect centerpiece on your table -- they're both eye-catching and delicious. Roast chicken brings good memories of Sunday brunches and family gatherings, and you can enjoy James & Daughters' 40-Clove Roasted Iberian Free-range Chicken (P2,200) by ordering an hour in advance. 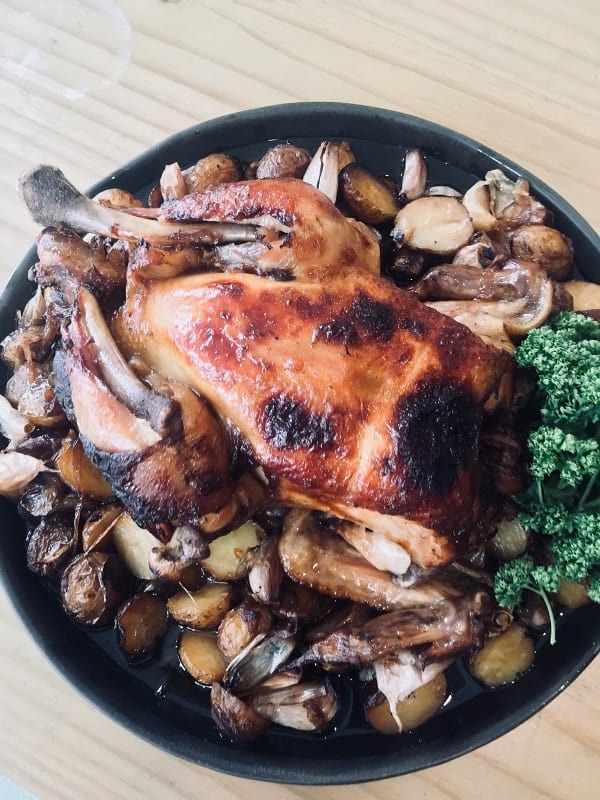 Their version of the classic comfort food is a whole Pamora chicken slow roasted in a woodfire oven, and served with roasted potatoes. Now, if you want something a little more unctuous and indulgent, look no further than the Pugon Oven Roasted Crispy Skin Pork Belly (P1,800). The brick-oven charcoal roasted pork belly gets extra flavor with its stuffing of aromatics, and the skin is thunderously crunchy. It's served with three kinds of dipping sauces: house blend spiced vinegar, fermented mustard leaves (mustasa), and Bicol express sauce. Anything tuna here is simply excellent, so you should definitely not miss out on the Tuna Belly & Panga (P1,600) that will bring you back to the sunniest beachside memories where meals of inihaw na tuna is a staple. 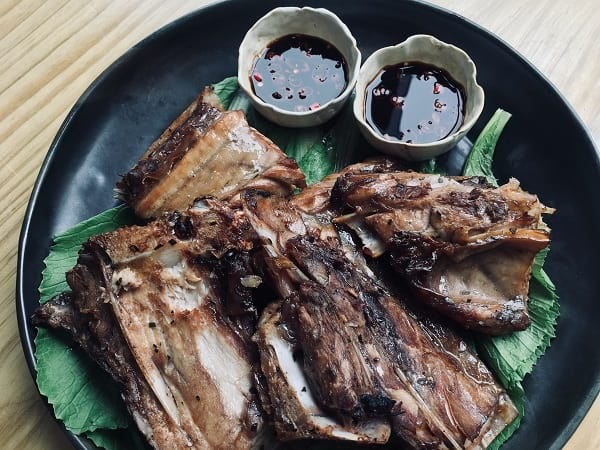 The barbecued yellowfin tuna jowl and belly are marinated in soy, calamansi, chili and kaffir, and it would be a sin to skip eating rice with this dish. 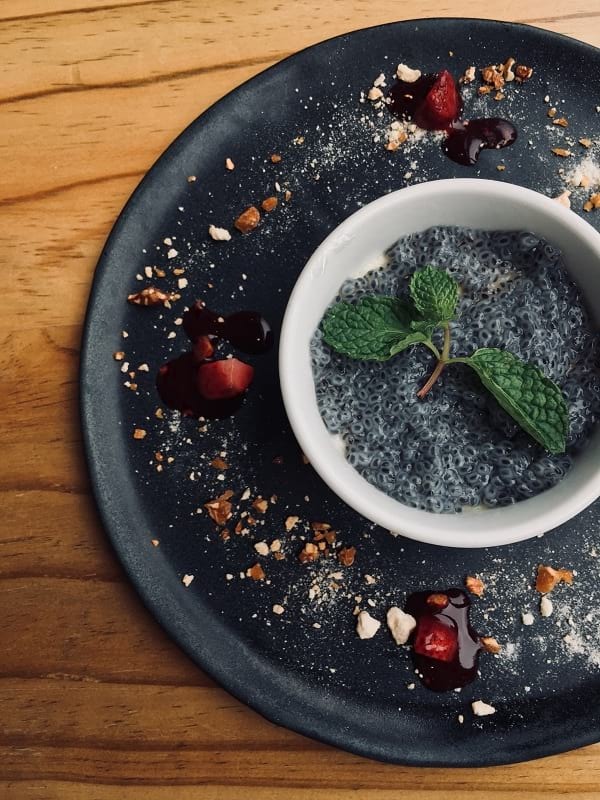 While most of the food at James & Daughters are homey and easily bring that comfort food vibe in every bite, the desserts here are gorgeously plated, as if they are coming straight from the kitchen of a hotel. It should come as no surprise, though, as Chef Jonas Ng has introduced to us his flair for elegant French cuisine through Le Jardin. His Ginger Milk Pudding (P100) is elegant, the dessert a nod to Hong Kong's iconic milk puddings. His version is light and airy, spiced with ginger, and topped with basil seeds that add a delightful texture with very spoonful. The dessert that instantly won me over is Suman ala Hasset (P200), beautiful from start to finish, from plating to palate. Chef Jonas recalls his conversations with the late Chef Hasset Go, when they were musing about creating a dessert that has all of the chef's most loved desserts on a single plate. 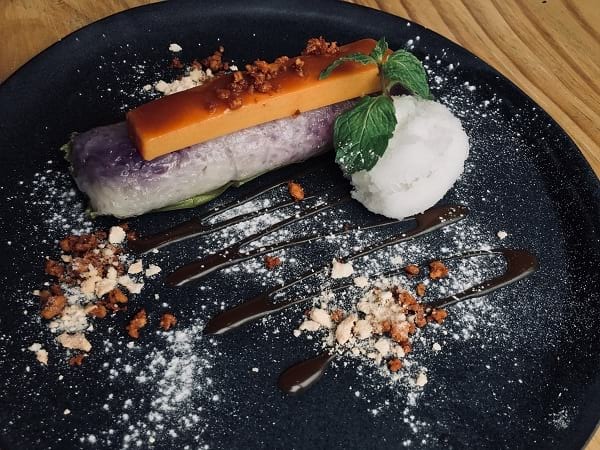 So in this dessert we have sticky suman (steamed rice) stuffed with ube halaya, topped with leche flan (vanilla custard), and served with latik (coconut glaze) and coconut sorbet. The interplay of the different sorts of sweetness, texture, and temperature is just lovely--this dessert is a wonderful ode to the chef's dear friend. 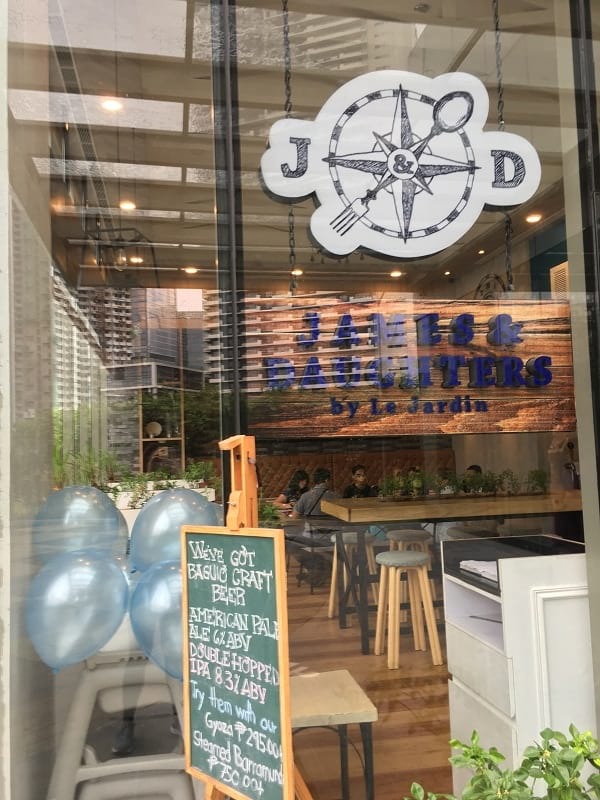 James & Daughters by Le Jardin is now open at the ground floor of The Westin Residences Manila Sonata (Westin Show Suites), 21st Drive, Bonifacio Global City, Taguig. The restaurant is open Tuesday to Sunday for breakfast (7am-11am), lunch (11am-3pm) and dinner (6pm-11pm). Visit their website jamesanddaughters.ph and follow on Instagram (@jamesanddaughters) and Facebook (/jamesanddaughters) for more information.